Palli Karma-Sahayak Foundation (PKSF) organized a day-long event divide into two sessions under the umbrella banner of Unnayane PKSF 2016. It took place on July 27, 2016. Both the sessions were presided over by Dr Qazi Kholiquzzaman Ahmad, Chairman, PKSF. In the first session, twenty two freedom fighters who are at present either Chairman or Chief Executive Officers of 18 Partner Organizations (POs) of PKSF were honoured for their brave and active participation in the glorious war of our liberation in 1971. 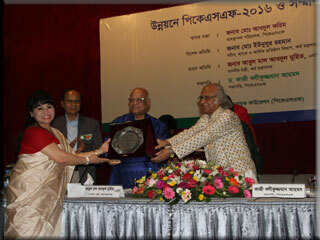 In the second session, PKSF bestowed life-time achievement to Mr Jamil Chowdhury, Chairman, Bangladesh Female Academy. This Female Academy is a home to orphan girls, who pursue their education and learn useful life-skills. A similar award was given to Ms Pam Thi Hong, Executive Director, Center for Education and Community Development (CECD), Hanoi, Vietnam. Ms Hong is playing a leading role in Vietnamese crab-hatchery technology transfer to PKSF projects. Dr Qazi Kholiquzzaman Ahmad in his speech noted that all PKSF interventions are morally fuelled by the spirit of our liberation war. He referred to the paradigm shift in PKSF ideology of evolving into an organization that upholds holistic development with focus on human dignity. He made special mention of the ENRICH programme of PKSF. Mr Md Abdul Karim, Managing Director, PKSF delivered his welcome note at the opening of both the sessions. He said that all PKSF activities are directed to facilitate the fulfillment of Vision 2021 of the government. Mr Md Fazle Rabbi Miah MP, Deputy Speaker of Bangladesh Parliament and Major General (Retd.) Helal Morshed Khan Bir Bikram, Chairman, Bangladesh Muktijoddha Sangsad were present in the first session as the chief guest and special guest respectively. 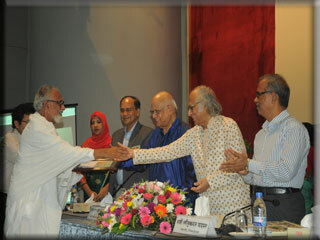 Mr Md Fazle Rabbi Miah handed over the crest and roll of honour to the valiant freedom fighters. Mr Helal Morshed Khan Bir Bikram lauded the PKSF initiative to honour the freedom fighters. Mr A M A Muhith, MP, Minister, Ministry of Finance, Government of the People’s Republic of Bangladesh was the chief guest of the second session. Mr Md Yunusur Rahman, Secretary, Banking and Financial Institutions Division, Ministry of Finance was present in the session as the special guest. The Finance Minister handed over the awards to Mr Jamil Chowdhury and Ms Pam Thi Hong. 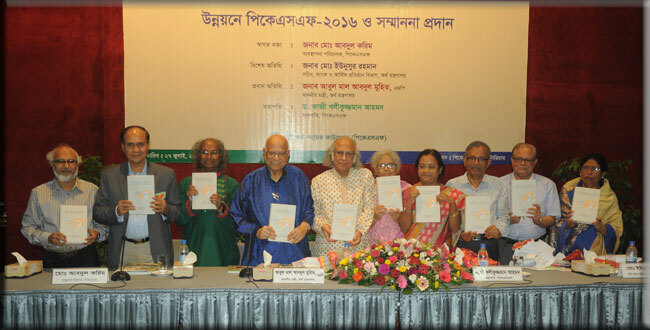 A book of essays in honour of A M A Muhith titled Bangladesh’s Development: Some Issues and Perspectives, edited by Dr Qazi Kholiquzzaman Ahmad and Prof. Shafi Ahmed was launched in the closing part of the second session.